Are you dealing with tooth loss? Dentures could help restore your smile. While you may equate missing teeth to senior citizens, anyone can face tooth loss no matter their age. This is why it’s so important to maintain good oral hygiene and to come in for routine checkups to make sure your teeth and gums are healthy. Of course, there are many factors that can lead to tooth loss. If you are missing several or all of your teeth then maybe our Cordova, TN, dentist Dr. Jason Botts has recommended that you get dentures. So, what are dentures and how can they help you? If you said “yes” then full dentures are the only kind that can replace all of your missing teeth. Full dentures are meant to help patients dealing with complete tooth loss, and they can replace both your upper and lower teeth. Full dentures are custom-made to fit right on top of the gums, where they will stay in place through natural suction. Do you still have some healthy teeth? 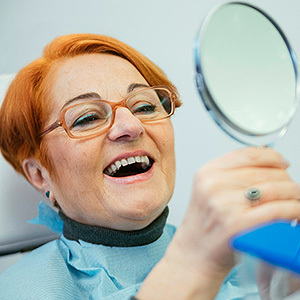 If you are dealing with tooth loss but you still have healthy teeth present then partial dentures will help replace those missing teeth to give you back a full smile. Partial dentures are designed to fill those gaps in your smile with one or more false teeth. There are several ways in which partial dentures can be placed. 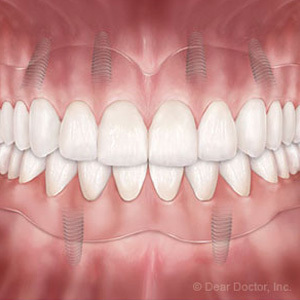 Removable partial dentures use attachments or clasps, which hold on to natural teeth to keep the false teeth in place. Fixed partial dentures will require dental crowns, which will be cemented over natural teeth to support one or more false teeth in the middle. If your Cordova, TN, restorative dentist has told you that you need to have one or more teeth removed it will take several weeks for the gums to heal after the extraction. Of course, we know that you don’t want to be without teeth during this time. This is where immediate dentures come in. While they aren’t as durable and don’t provide as ideal a fit as your permanent dentures will be, this can provide you with the temporary teeth you’ll need so you can still chew and speak while also allowing your gums time to properly heal. Do you want to keep dentures in place? Are you currently wearing dentures but find it difficult to keep your dentures in place? If they shift or move around in your mouth then you may want to talk to us about getting dental implants to support your false teeth. While it can take several months to get dental implants they can hold your dentures firmly in place to prevent them from moving around. Botts Dental Spa in Cordova, TN, is dedicated to helping restore your smile after trauma, tooth loss or other dental issues. You can get a beautiful smile back with the help of restorative dentistry and our dental team is here to help. Call us for a consultation today and let’s talk about dentures.